KitKat Chunky Salted Caramel Fudge bars are available in all good stores right now. 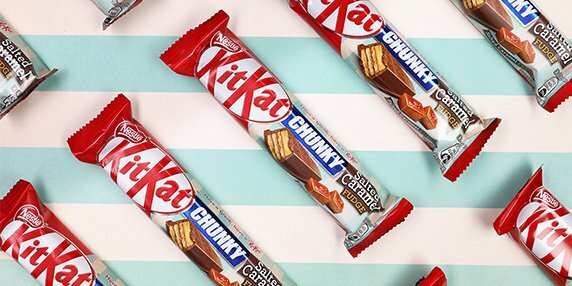 Nestlé UK and Ireland has introduced a brand new flavoured chocolate bar to join its ever popular Kitkat Chunky range. A delicious bar made from a combination of crispy wafer with a salted caramel fudge flavoured topping, covered in milk chocolate. Making the new KitKat Chunky Salted Caramel the stuff of legends. Not only does the new KitKat taste great, but the new packaging has been inspired by a retro sweetshop design with turquoise stripes and appetising imagery. The new bar has been launched as part of Nestles brand strategy to excite consumers by rotating a few flavours every year. Last year saw the dawn of the KitKat Chunky New York Cheesecake, where were we when this was released? The bar was a hit among millennials with over 70% saying they would try it again. Whilst in 2016 the new KitKat Chunky Cookie Dough was the No. 1 chocolate singles launch. Both of these are evidence that consumers are open to trialling new flavours from the brand. 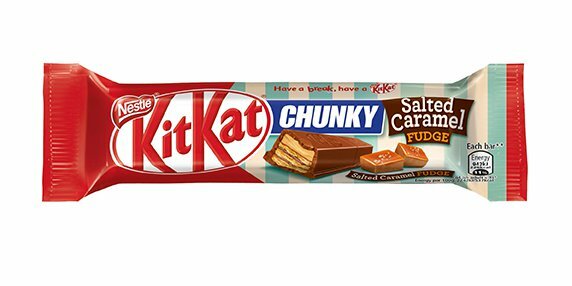 KitKat fans love exciting new combinations and flavours from their favourite brand, and with the ongoing popularity of salted caramel, we thought it was only right to bring this salty-sweet combination to KitKat Chunky. Following the incredible success of KitKat Chunky New York Cheesecake and KitKat Chunky Cookie Dough, this year’s bar has all the credentials to be yet another smash hit. So before you reach 11am this morning get yourself down to your nearest shop and grab yourself a KitKat Chunky Salted Caramel Fudgebar. These bad boys are available right now and are perfect for having a break. KitKat has been around for more than 80 years and continues to be one of the most popular chocolate bars in the UK. KitKatChunky was launched all the way back in 1999, think we can just about remember that, and over the years it has been frequently innovated to deliver exciting new flavours. These flavours have included Peanut Butter, Hazelnut, Coconut, Chocolate Fudge and many more.